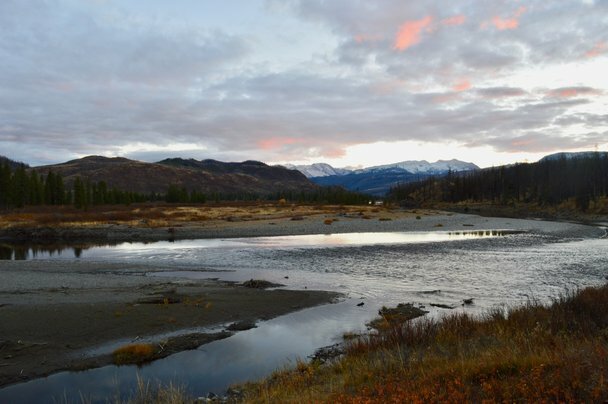 We planned to drive the Bear Tooth Highway at the start of our journey into Yellowstone however we found out that they closed the route early due to inclement weather, so we missed out by a few days! So far, we are 0/2 for the “must-do” scenic highways, but we feel as though we have still found some pretty great routes! 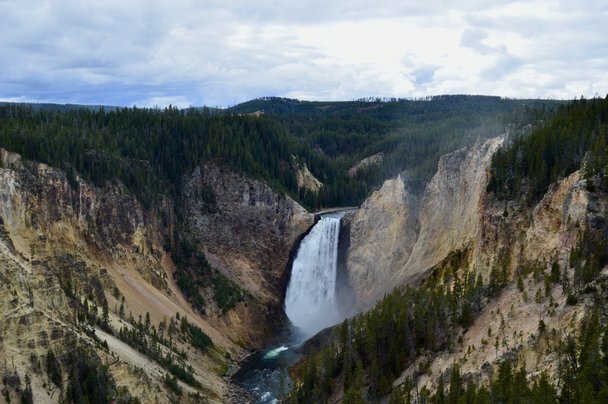 We did Yellowstone National Park over two days as the park is huge! 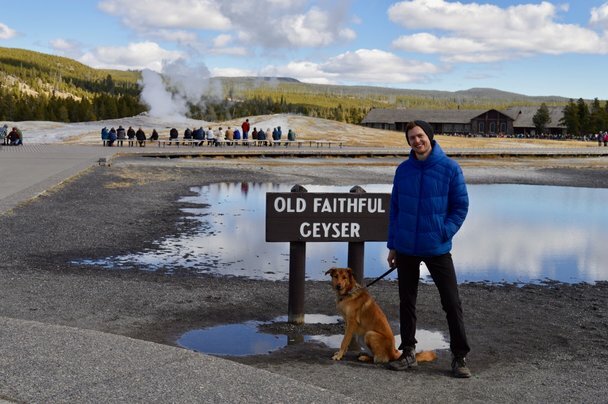 We could have easily spent longer, however, similarly to Glacier National Park, Yellowstone was very restricted in terms of where you could take your dog. This was understandable as there were boiling hot springs everywhere you looked! Roo has a little “den” setup in the back of our truck with her toys and water so she is quite content to be left in the truck. Both Mitchell and I were excited to experience Wyoming for the first time and it did not disappoint. 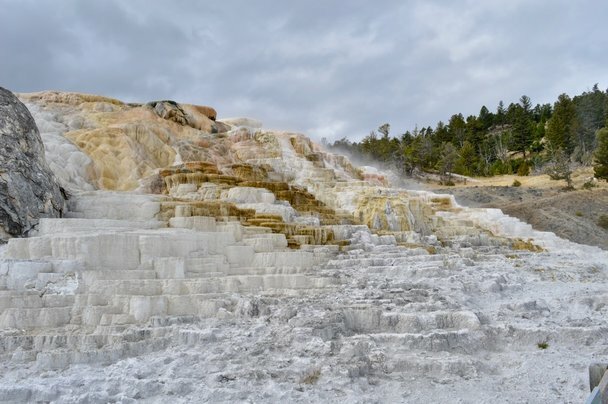 While most of what we saw was limited to Yellowstone National Park, there was so much to see within the park it was incredible. We saw geysers, hot springs, lakes, canyon’s, mud pots, antelope, bison and elk and most of this wasn’t too far from the road. I would love to come back and go horseback riding along some of the beautiful trails we encountered! • Camping south of Yellowstone on National Forest Land – at first it was very windy and quite cold but the sun ended up coming out just in time for dinner making this a breathtaking spot. 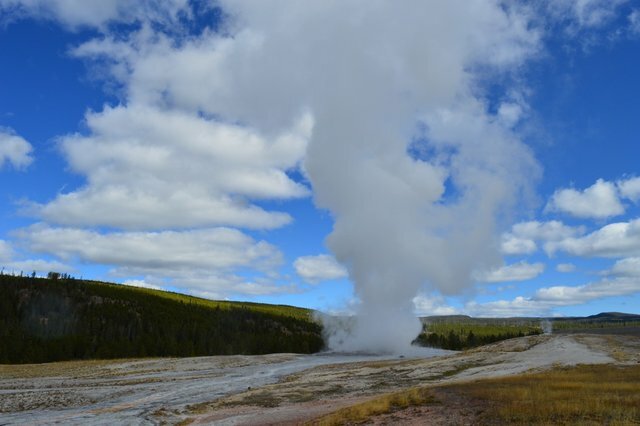 • Old Faithful Geyser – this geyser erupts almost every 90 minutes so you can time your viewing! The visitor center posts when the next eruption will be and they are usually able to estimate the eruption within a +/- 10 minute window! • Mitchell and Brenna lose each other – here’s a fun story, due to the timeline for the eruption of Old Faithful we decided to split up tasks and meet back at a certain place to watch the eruption. You would think this is straight forward, however somehow, we ended up not being able to find each other for around 30 minutes. Neither of us have US cell phone plans active and have been relying on data or Wi-Fi which there was neither so we couldn’t communicate. Needless to say, we missed that eruption. It depends on who you ask but one of us wasn’t in the spot and the other waited then went looking and so on and so forth. After some debate our key takeaway is always meet back at the truck, and do not move the truck! In this instance the truck was moved further complicating matters… If you’re worried about where Roo was during all of this she was with Mitchell and they were hunting for Brenna together! Once the team was reunited all was well and we got to watch the next Old Faithful eruption together. While dogs can’t go right up to watch Old Faithful erupt you can view it from a little farther away, and there are significantly less crowds. One tool I use to keep track of where I am is the phone app, Avenza Maps. It is satellite driven so I think it works everywhere in the world. Not sure if it helps find other people. Yeah, apparently it’s the finding other people part we need help with ha! I’ll check out the app – thanks for the recommendation!